The camp of Strickland's opponent took aim at the Democrat's humble upbringing. (CNN) - The first line of Ohio Gov. 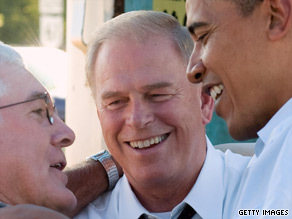 Ted Strickland's campaign biography boasts the Democratic governor is "the son of a steelworker" who "never imagined he'd be able to go to college." Indeed, Strickland's humble upbringing is just the type campaigns love to highlight, and never more so during an economic climate that still hasn't shown signs for recovery for many Ohioans. But the campaign of Strickland's Republican opponent -former U.S. Rep. John Kasich – is causing a stir for attacking the same simple origins Strickland celebrates. Kasich spokesman Rob Nichols said in a statement Tuesday Strickland is a poor manager of Ohio's cities because the Democrat was raised "in a chicken shack on Duck Run." Nichols' statement came after Strickland's running mate, Yvette Brown, said in a recent speech, "Ted didn't grow up in city, but he fights for our cities every day." "Not until Ted Strickland feared needing their votes did he give urban Ohioans a second thought. Having grown up in a chicken shack on Duck Run, he has all but ignored our cities' economies and their workers," Nichols said in the statement responding to Brown's speech. Strickland's campaign seized on the slap at Strickland's upbringing, saying, "Only the Congressman from Wall Street would be so out of touch as to insult Ted's humble upbringing." "While Congressman Kasich may have spent a lot of time in boardrooms at Lehman Brothers and rubbing elbows with lobbyists at cocktail parties in Washington, Ohioans are looking for a Governor who will represent their values-and clearly that is not John Kasich," spokesman Lis Smith said. Nichols has since said he did not mean his comments as an insult, but Strickland's campaign has organized a conference call later Wednesday with "representatives from rural and Appalachian Ohio" to take aim at the comments. UPDATE: Democratic National Committee Chairman Tim Kaine, speaking in Cleveland Wednesday, also took a hit at the comments. I thought the right was against "elites" and favored the common folk. Oh wait, that's only if the common folk is a republican. Otherwise elite is ok.
>"Nichols has since said he did not mean his comments as an insult"
That's not only mean, it's pretty ignorant as well. What a vile person this Stickland must be. I think we sould bomb the hills of agasin tell their dust and can not be crossed easy use b52 dum boombs and napam do this 24 hours a day for a week and see what happens. I always thought that Kasich was half way intelligent, and then he says this? To whom is this supposed to appeal? How can anyone seriously think that Republicans represent Main Street, when they constantly show us their elitist colors? All politicians no matter what party are mostly liars, tax cheats, egotistical, ignorant and self serving. There, that covers their good points. It appears that ALL REPUBLICANS FAILED KINDERGARTEN. They can have decency and still question someone's ability or experience, but they choose not to exercise that decency in most cases. It's shameful and a sad statement on a certain segment of our society. Yup, sounds like a GOPiggie!! If you weren't so stupid you wouldn't be writing what you wrote, the mess that Ohio in ubder it is because the likes of you brough the previous idots to power, so shut up and crawl under a rock if you cannot keep your ignotant mouth shut. Once again it's Christmas in June for the Democrats with the Republicans playing an obtuse Santa. Apologies to BP and comments that President Obama is "extorting" or "fleecing" BP-they literally do not get life in America. From now on I'm demanding that every Republican show me their birth certificate since they cannot have been born in this country and possibly this planet, .